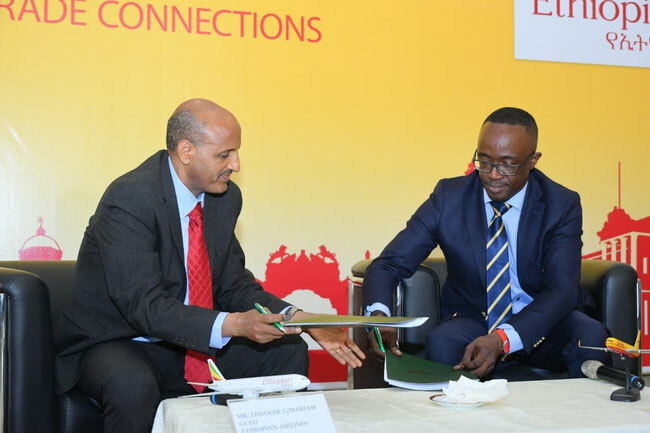 As reported by CargoForwarder Global (16 July edition), Ethiopian Airlines (ET) and DHL Global Forwarding (DHL-GF) have engaged in a joint venture, named DHL-Ethiopian Airlines Logistics Services Ltd. Headquartered in Addis Ababa, ET has become the majority owner (51%) with DHL-GF holding the remaining 49%. For Deutsche Post Group member DHL G-F it is the first agreement of its kind signed with an ally – constituting a real novelty. Through the accord the business relationship existing between DHL and Ethiopian Airlines for some 10 years is further expanded and deepened. The newly signed pact comprises the launch of intra-African air transport and road services and provides for regional but also global origin-destination transport solutions by plane, ship or truck. But that’s only one side of the coin since the partner’s plans go far beyond transportation solutions, including projects to successively upgrade Ethiopia’s logistics infrastructure where mostly needed to speed up processes and secure product integrity. Seen from DHL’s point of view the company’s forwarding arm widens its African footprint, where the field is already well set since years by sister company DHL Express that operates cargo flights in more than 50 sub-Sahara countries. “As Deutsche Post-DHL we have already developed the African market quite well,” confirms communications manager David Stoeppler. Conversely, ET gets a partner that offers a global network, providing delivery services for Ethiopia produced exports to the smallest European, Asian or American village. Both JV partners emphasize that they aim at providing much-needed freight capacity to Ethiopia, thus strengthening the central hub function of Addis Ababa for intra-African but similarly intercontinental traffic. The timing for their bundling of competencies couldn’t be any better, after long-lasting political and military tensions between Ethiopia and neighbor Eritrea have recently been eased. Simultaneously, Ethiopian Prime Minister Abiy Ahmed and his government have decided to scale back protectionism and liberalise a number of economic sectors instead, including aviation. “This was a key precondition for us to sign the joint venture with Ethiopian Airlines,” argues DHL-GF speaker Stoeppler. The liaison between both companies is result of a process that started a decade ago when ET awarded a contract to DHL-GF for supporting the maintenance, repair, and overhaul (MRO) operations of Ethiopian Airlines, providing supplies of aircraft parts, engines and mechanical modules. This was followed by textiles, foodstuff and beverages – via air and ocean freight between Europe and Asia. “Obviously, we performed well over all the years, whereby the mutual trust in the partnership grew steadily,” reasons Mr Stoeppler. Hence, the way was paved for the joint venture signed last Thursday. Pramod Bagalwadi, a DHL veteran with over two decades of experience in management roles within the logistics industry, has been appointed to head the joint venture.